Holy Church of St Spyridon, Aigaleo 2002. Chanted by the choir of the Association of Constantinopolitan Friends of Music. Chanted by the ever-memorable Archcantor Demetrios Magoures. Chanted by Thrasyvoulos Stanitsas, Archon Archcantor of the Great Church of Christ (1974). Heirmoi of the double Katavasiæ. Chanted by Thrasyvoulos Stanitsas (1974). Chanted by Basil Nikolaides and Basil Emmanuelides. Chanted by Demosthenes Paikopoulos, Archon Domestikos of the Great Church of Christ. 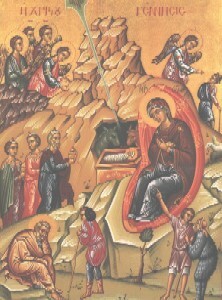 Chanted by the choirs of the Holy Theological School of Chalki (1961). Chanted by the first choir of the Holy Theological School of Chalki (1961). Chanted by the second choir of the Holy Theological School of Chalki (1961).